In Southern California, people began reporting findings of extra-large guinea pigs starting in 2010. 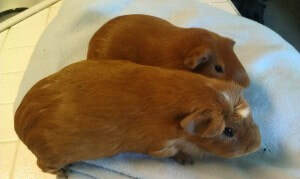 Typically, shelters don’t contact rescues for help, but a large number of these large guinea pigs were so difficult to handle that they were deemed unadoptable. It came to be known that Petco was the distributor of these guinea pigs and that they were “a new type of guinea pig”. However, this was not quite accurate. These guinea pigs were new to the United States, but these were in fact a breed of guinea pig related to the Cuys Criollos Mejorados, or the guinea pigs raised in South America for food. These giant guinea pigs and our pet guinea pigs are all the same species of guinea pig, the Cavia Porcellus, but they are different breeds. Inside sources from Petco revealed that these giant guinea pigs were imported from Peru. The name Cuy is South American Spanish for members of the species Cavia porcellus, which is the same species of guinea pig seen in the United States. These guinea pigs are much larger, however, because they are a domesticated guinea pig kept as livestock for meat. The breeds of guinea pigs in those countries are larger than the guinea pigs bred as pets in North America and Europe, but they are the same species. This is not to be mistaken for the species referred to as cuy in Brazil, where the name cuy refers to a different, but related species, Cavia aperea, or prea. Within the last half decade, American pet breeders have “discovered” South American breeds of guinea pig and are trying to breed them and introduce them as pets within the United States. However, these giant guinea pigs, as they have come to be known, are not ideal pets. It appears they are difficult to handle and become stressed easily in the presence of people. They are likely difficult to handle and tame because they are feral and may have reached adulthood without much handling. They oftentimes have polydactyly, a genetic defect, which may indicate other genetic health defects. There is also a thought that Cuys have an even shorter lifespan than the average guinea pigs and may be prone to heart disease or have unexplained sudden deaths before three years of age. What is known about these giant guinea pigs is that they are always red, red and white or white in color. Many have a mutation that results in extra toes, called polydactyly (commonly, 6 toes on front feet and 5 on back in a polydactyly guinea pig). They typically weigh between 4-8 pounds when adult, compared to a typical pet guinea pig which typically only reaches two pounds at adulthood. These giant guinea pigs may have a draw because they are novel and therefore interesting, but they do not make ideal pets. Most times, guinea pigs are family pets, particularly for children. However, these giant guinea pigs are incredibly strong and difficult to tame. They are not an ideal pet because they are large, very scared and skittish, and very hard to tame. Also, they can oftentimes be underfed because owners are expecting a small guinea pig and unaware that they have a giant guinea pig. Oftentimes, they have more fear of humans than domestic guinea pigs. Because of their wild nature, they are much more likely to be relinquished to a shelter than regular-sized guinea pigs. If you are in a pet store and are concerned that the guinea pig you are purchasing may be a giant guinea pig (cuy), you can look for some telltale signs. First, look for extra numbers of toes. They have a particularly large nose and grow at seemingly abnormal rapid rate. The cuy, unlike regular guinea pigs, will make an audible breathing sound through their nose when picked up and do not like being handled. They are usually only orange, orange and white, or white. Black cuys have never been seen. They have big floppy ears and more muscular, rectangular bodies. 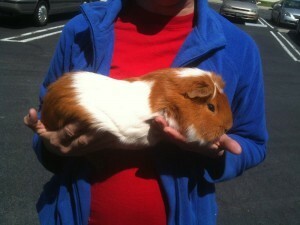 As of this time, giant guinea pigs are continuing to be sold in California pet stores. Rescues are finding them abandoned outside, in dumpsters, and terribly neglected. One concern expressed is that the behavior of giant guinea pigs may mar the attitude of the general public toward the generally docile and well behaved common pet guinea pig. Giant guinea pigs do best in an experienced adult home. Although cuys can live with standard-sized guinea pigs, it seems that an increasing number of young cuy have social difficulties and can be very dominant and aggressive, even the sows. Male giant guinea pigs should be neutered at a young age to help them become more receptive to handling. A neutered male is more likely to bond with other guinea pigs. Cuys also have impressive appetites and tend to have shorter lifespans than standard guinea pigs. Some cuys are calm and easygoing. We believe this is due to extensive handing from a very young age through adulthood, however this seems to be more the exception than the rule for both male and female cuys. Typically, giant guinea pigs often struggle, kick, and squeal loudly in an attempt to get away. If you believe you have a giant guinea pig, please report this to the following link below. It is recommended to have a veterinary exam to confirm this prior to submitting this form. If you are interested in adopting a giant guinea pig as a pet, please keep in mind these guinea pigs require a high level of attention, care, and are not ideal for children. Cuy need loving homes, too, and are not for a first-time pet owner! Please contact Wee Companions Small Animal Adoption or Los Angeles Guinea Pig Rescue for details on how to adopt. As these shelters are in California, the location may prohibit many here from adopting due to distance. A special thanks to Wee Companions Small Animal Adoption Center and Los Angeles Guinea Pig Rescue for the material and resources cited in this paper.